Now if there’s another thing I can tell you about my MIL, she loves a good Mudslide. 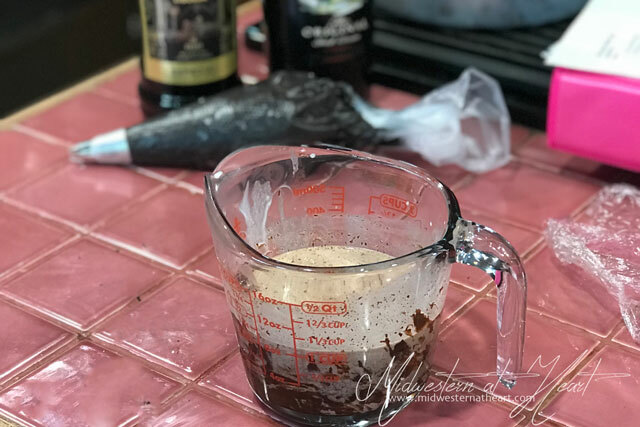 So with my Cake excursions this year, I went in search of a good Mudslide recipe. When I didn’t find what I wanted, I set out to make my own. And that’s just what I did. 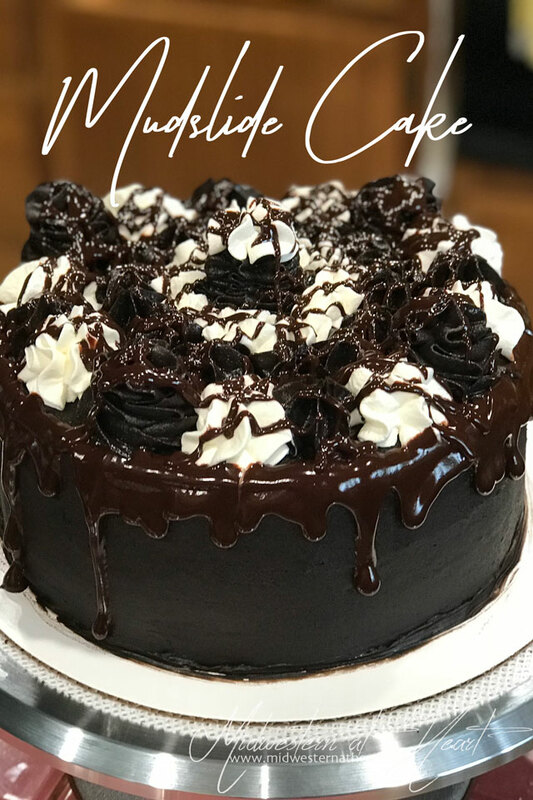 I made a Mudslide Cake in honor of my MIL. 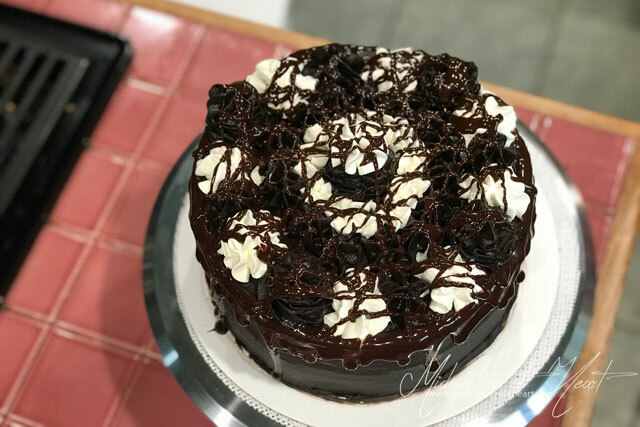 Seems like most of the “mudslide” cakes I found were Mississippi Mudslide cakes. Not exactly what I was looking for. The actual Mississippi Mudslide drink is made with bourbon. 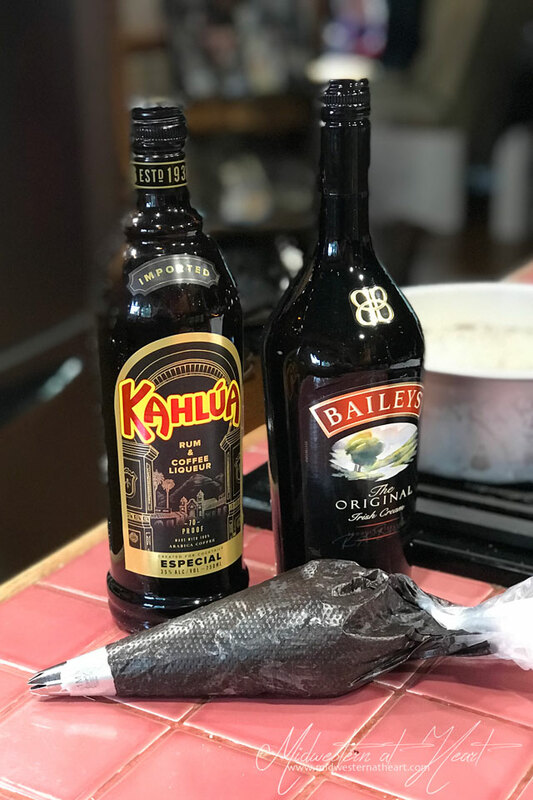 The mudslide drink that my MIL likes is made with Kalhúa and Baileys Irish Cream. Should I mention now that the only reason I knew what went into her Mudslide is that hubby told me? Yes, I have drank, but no, I really don’t drink much. 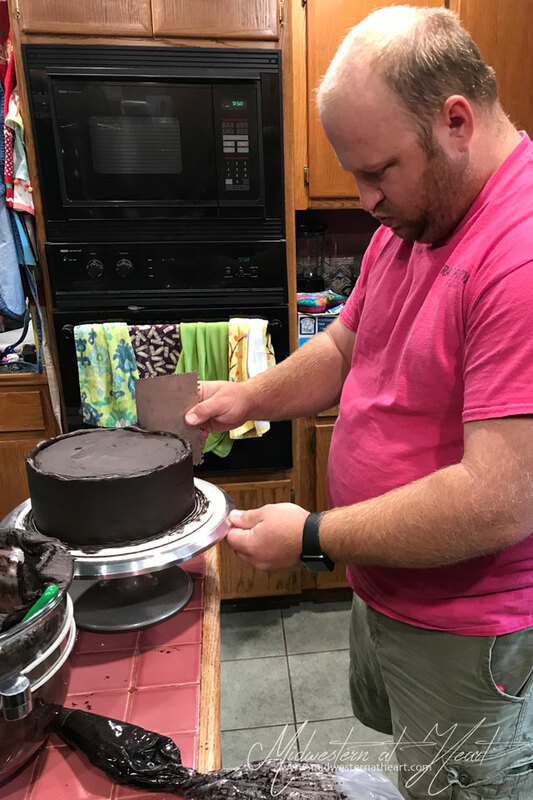 So, I kind of based my cake off of I Am Baker‘s Mississippi Mud Cake. But the thing is, her cake didn’t have any alcohol in it. So I swapped out the water for 1/2 cup Kahlúa and 1/2 cup Bailey’s. Now, when you cook/bake, the alcohol bakes out for the most part and just enhances the flavor overall. So to say that cake was boozy tasting, it was. It tasted like a Mudslide. When we went to Florida three years ago, I actually tasted my first mudslide. I still blame Memaw… lol. Then came the icing. What to do, what to do. I still wanted that Mudslide taste/feel. I read through a bunch of different recipes and still wasn’t sold on any icing recipes, so enter in, changing up my buttercream recipe. Normally in my buttercream, I use shortening. I live in hot, humid Missouri (yes, Missouri is extremely Humid). Shortening stands up better to the hot summer humidity than butter… but in this instance, I used butter! What?!?! And not just any butter… European Butter. There is something different about European butter. This particular European butter came from our trip to San Antonio. I won’t be able to replace it as easily, but a few weeks ago we went to Springfield and Hello, I found a lot of choices in European Butter there. That’s a lot closer drive… 1 hour versus like 10. I think the 1 hour wins. The other thing I opted for was Dark Cocoa Powder. I chose it over regular cocoa powder. The cake I used regular cocoa powder, but the icing I went with the dark. No reason other than, that’s what I did. 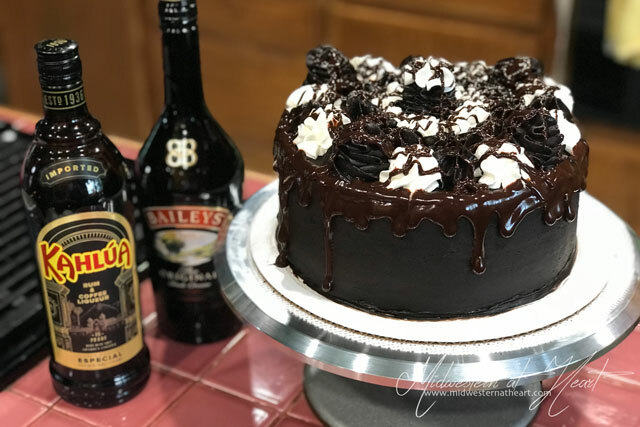 So we have Kahlúa and Baileys in the cake and the icing… what to do, what to do about the ganache. Okay, I left it normal. I didn’t add any booze to the ganache. Hey… there’s regular chocolate used in a Mudslide cup on the sides. Mudslides really have a beautiful presentation on the glass. Really a pretty presentation overall. I put the ganache in a spread bottle. I wasn’t going to do an all over ganache cover on the cake top with the drip. I just wanted a partial drip. 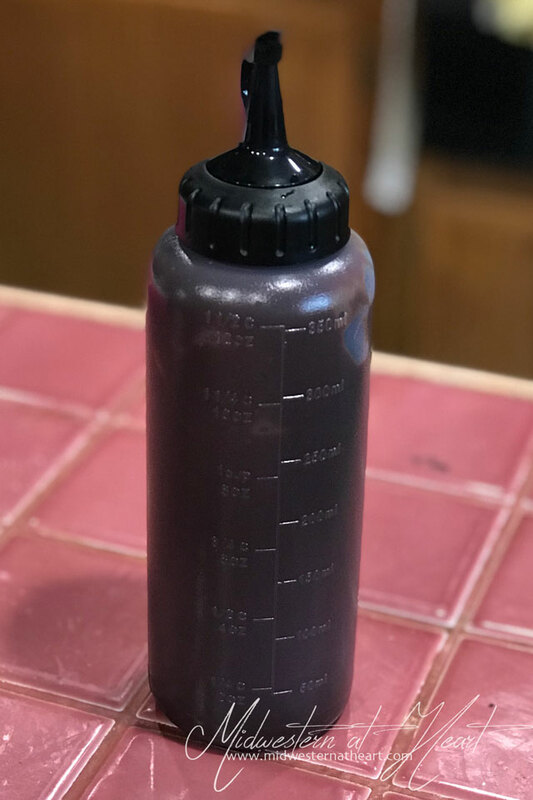 When you do all over the top and the drip, you can mainly put it on the top and then just push off the sides or else use a drip bottle or piping bag with small tip cut. I bought these drip bottles so I was excited to try them. I wouldn’t recommend them sadly. The opening on the tip is too large. They’d be great for dressings, etc, but not a ganache drip. Lesson learned, twice. What do I mean by that? Well, the bottles I bought came in a set of 2. One bigger, one smaller. Now, what I really think I need is like a ketchup bottle. That’s my next try if that doesn’t work, it’s back to piping bags. Okay, finally, when you get a mudslide, it comes with whipped cream. I debated and debated. Then I decided, yes, it needs whipped cream on top because it’s based on the drink. Plus, everything is chocolate, it needed a little color. When I made the whipped cream, I decided to add a little baileys into it. When I say little, I mean a splash. Normally when you make whipped cream, you add a splash of vanilla so why not a splash of Bailey’s to tie it all together. An extra thought on that… Add vanilla too. When you add the vanilla, add it first, then add the Bailey’s. So vanilla helps to boost flavor when you add other flavors but you always add it first. The end product was delicious. It was quite rich. Extremely rich. I should have taken a smaller piece. But gosh was it yummy! What was leftover I sent with my MIL to work. I figured her co-workers would be happy, right?!?! 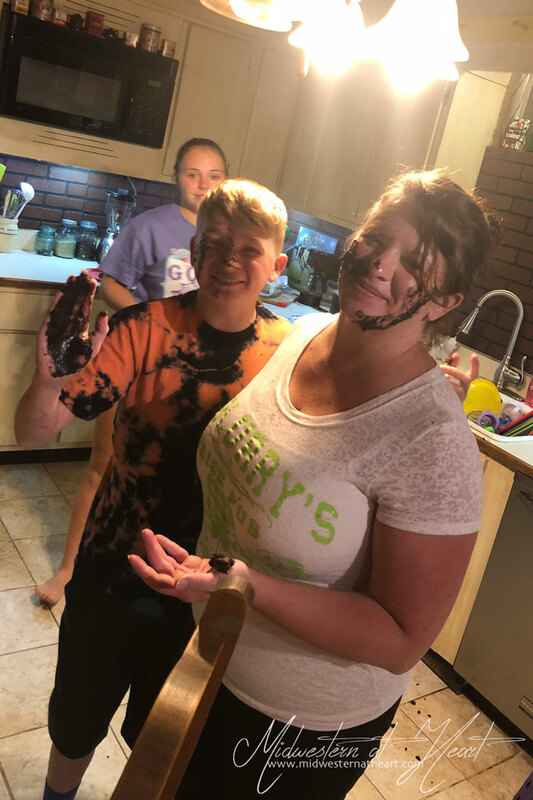 And this picture below… So there was some icing left over on a couple plates and Tbug, DL, and my Sister in law apparently got into a food fight. Luckily I stayed out of the kitchen, therefore I was out of the line of fire. It’s boozy, it’s chocolatey, It tastes like a Mudslide drink in Cake form. For the cake: Preheat oven to 350˚F. Prepare three 8-inch round cake pans with non-stick spray and parchment circles. In the bowl of a stand mixer with the whisk attachment, add the granulated sugar and eggs. Beat on high for 2-3 minutes. Meanwhile, combine the hot water, Kahlúa, Baileys Irish Cream, cocoa powder, instant coffee, and salt. With the mixer on lowest setting, add to sugar mixture. With the mixer still on low, steadily add in flour, baking soda, and baking powder. Let it mix to incorporate. Do not overmix. Add in oil, buttermilk, and vanilla. Scrape down sides and bottom of the bowl as needed. Remember: Do not overmix. Pour batter into prepared cake pans evenly, using a kitchen scale if you need. Bake for 25-30 minutes or until fully baked and a toothpick inserted in the middle of the cake comes out clean. Let cakes cool in pans at least 10 minutes. Let cakes cool to room temperature before assembling. For the icing: add Kahlúa, Baileys Irish Cream, and salt to mixer. Turn on and allow salt to dissolve. Add meringue powder, instant coffee, cocoa powder, and vanilla. Mix together. Then add 1 cup butter. Beat. Add 6 cups powdered sugar slowly making sure to fully incorporate. Add remaining cup of butter. Beat. Then add remaining 2 cups powdered sugar. Fully incorporate. The icing needs to be a spreadable consistency. Add 1 tbsp hot water, beat, repeat until the icing has been thinned to a spreadable consistency. 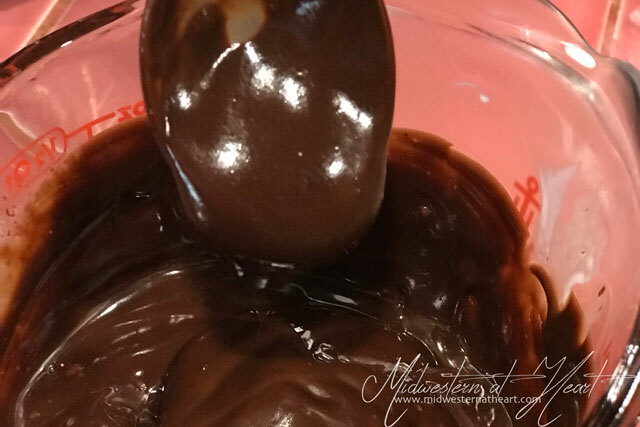 For the ganache: place the heavy whipping cream in the microwave for 1-2 minutes until it just reaches a boil. Then add dark chocolate chips. Cover with plastic wrap and allow to sit on the counter for about 5 minutes until chocolate melts. Stir. If it doesn’t fully incorporate pop it back into the microwave for 15-30 seconds at a time until it fully incorporates. Place in a piping bag or ganache bottle, set aside to cool slightly. You don’t want it too hot! For the heavy whipping cream: Make sure heavy whipping cream is cold! Put it in the freezer for 15-30 minutes if you want, but make sure it’s cold. You can also put the mixing bowl/whisk in the refrigerator or freezer as well. You want it cold :). Do you get that haha. Beat until soft peaks form, then add powdered sugar, a splash of Bailey’s, and a splash of vanilla. To assemble: smear a small amount of icing on a cake board. Place 1 layer of cake in the middle of the cake board. Spread a thin layer of icing on top of the cake, evenly. Place a second cake layer, repeat. Finally, place the third layer of the cake on top. Spread a thin crumb coat over top and sides of cake. Place in the refrigerator for 20-30 minutes until firm. Once firm spread icing on top of the crumb coat and spread evenly and smooth. Place remaining icing into a piping bag fitted with a large tip (I used a Wilton/Atecco 1M). Make dollops of icing on top of the cake. Then, in a second piping bag fitted with the same tip or a different one, place the whipped cream. Place dollops on either side of the chocolate icing dollops. Fill in the middle of the top of the cake with icing and whipped cream as well. Around the edge using a drizzle bottle or piping bag, make a cake drip. The colder the cake the better so if your cake is warming up, pop it back in the refrigerator for 15-30 minutes. The cold cake helps the drip lines to stop in their tracks. The harder the pressure, the longer the drip. To finish it off, spread a drizzle of icing all over the top of the cake. Keep in the refrigerator until ready to serve. Serve straight out of the refrigerator or pull out for no more than 30 minutes to allow the icing to somewhat come to room temperature. But the colder, the more it reminds you of the Mudslide drink. Optional: To really make it like a mudslide, serve with ice cream… but this is a rich dessert and ice cream isn’t totally necessary!